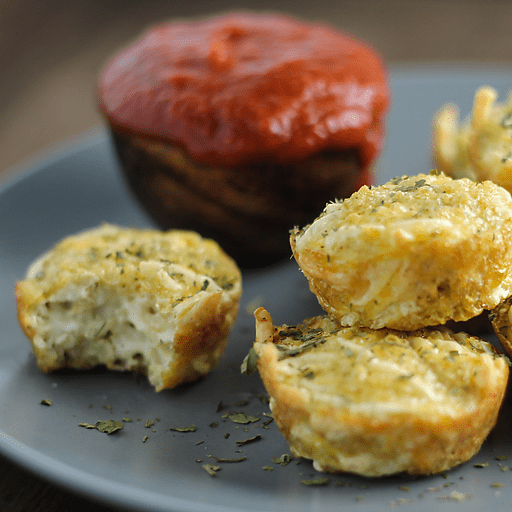 Bound together by creamy, calcium-rich cheese, this fun and nutritious finger food is perfect for the whole family, especially when it’s dipped in your favorite pizza sauce. 1. Preheat oven to 350°F. Spray 18 mini muffin tins with cooking spray. Set aside. 1. In a large bowl, combine cooked quinoa, eggs, mozzarella, pepperoni and salt. Mix until well combined and then transfer to mini muffin tins. 1. Bake for 25-30 minutes or until browned. Immediately transfer to cooling rack. Serve with pizza sauce for dipping. For dairy free: Use Daiya Mozzarella-Style Shreds in place of shredded mozzarella. For gluten free: Use certified gluten free quinoa in place of quinoa. Calories 150, Total Fat 8g (Saturated 3.5g, Trans 0g), Cholesterol 115mg, Sodium 440mg, Total Carbohydrate 8g (Dietary Fiber 1g, Sugars 1g), Protein 12g, Vitamin A 6%, Vitamin C 0%, Calcium 15%, Iron 6% *Nutritional values are an approximation. Actual nutritional values may vary due to preparation techniques, variations related to suppliers, regional and seasonal differences, or rounding.